Protein Blend (Whey Protein Concentrate, Whey Protein Isolate), Vegetable Oils (Palm, Palm Kernel, Soybean), Vegetable Glycerin, Gelatin, Soy Protein Isolate, Polydextrose, Maltitol, Sorbitol, Water, Peanuts, Sugar, Non-Fat Dry Milk, Heavy Cream, Brown Rice Flour, Tapioca Syrup, Cocoa (processed with alkali), Natural Flavors, Salt, Mono and Diglycerides, Sunflower Lecithin, Disodium Phosphate, Baking Soda, Potassium Sorbate (preserves freshness), Caramel Color, Whey, Soy Lecithin, Beta-Carotene, Vitamin A Palmitate, Almonds, and Sucralose. EXCESS CONSUMPTION MAY HAVE A LAXATIVE EFFECT. Store at 55F-75F. Protect from heat, light, and moisture. Do not purchase if seal is broken. Protein Blend (Whey Protein Concentrate, Whey Protein Isolate), Vegetable Oils (Palm, Palm Kernel, Soybean), Vegetable Glycerin, Soy Protein Isolate, Gelatin, Sorbitol, Maltitol, Water, Sugar, Cocoa (processed with alkali), Corn Syrup, Sunflower Oil, Chocolate Liquor, Cocoa Butter, Natural Flavors, Maltodextrin, Salt, Sodium Caseinate, Propylene Glycol Mono Esters, Baking Soda, Mono and Diglycerides, Soy Lecithin, Potassium Sorbate (preserves freshness), Acetylated Monoglycerides, Sunflower Lecithin, Whey, Beta-Carotene, Vitamin A Palmitate, Natural Tocopherols, Silicon Dioxide, Sorbitan Tristearate, Almond, Peanut, and Sucralose. Protein Blend (Whey Protein Concentrate, Whey Protein Isolate), Vegetable Glycerin, Peanuts, Gelatin, Vegetable Oils (Palm, Palm Kernel, Soybean), Soy Protein Isolate, Sorbitol, Brown Rice Flour, Water, Sugar, Corn Syrup, Salt, Sunflower Oil, Natural Flavors, Dextrose, Maltodextrin, Sodium Caseinate, Propylene Glycol Mono Esters, Baking Soda, Reduced Mineral Whey Powder, Mono and Diglycerides, Soy Lecithin, Potassium Sorbate (preserves freshness), Maltitol, Cocoa (processed with alkali), Acetylated Monoglycerides, Sunflower Lecithin, Whey, Beta-Carotene, Vitamin A Palmitate, Natural Tocopherols, Silicon Dioxide, Almond, and Sucralose. Oct 10, 2017 ProSupps MyBar PRO — The Bigger and Better MyBar! As if the amazing ProSupps MyBar wasn't good enough, they now have a 30g protein version named ProSupps MyBar Pro! ProSupps MyBar Pro was created with the idea that greatness can always be improved upon. With the success of the true original, elite formula and flavor MyBar, we went back to the drawing board to take it to the next level. 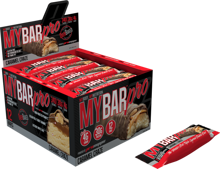 As a result, MyBar Pro has arrived featuring 30g of premium, high biological value protein per bar, minimal sugar, no 'fake fibers' and the world-class formula, soft-baked texture and gourmet flavor you have come to expect. Take your nutrition to the next level with MyBar Pro. Unlike other protein bars out there, MyBar Pro utilizes whey protein isolate and concentrate as the primary protein sources which have the highest Biological Value (BV) and Net Protein Utilization (NPU) of any protein sources on the market. On the other hand, other so-called 'complete' protein cookies use protein sources with lower BV and NPU such as pea, brown rice or wheat protein. Biological Value (BV) is a primary measure of protein quality, measuring how well the human body utilizes a protein, tested using nitrogen values retained by the body. Net Protein Utilization (NPU) is another measure of how well the protein is utilized, and measures protein intake vs. secretion from the body. A protein is only as good as what the body can utilize for lean tissue and muscle formation, so why would you settle for an inferior protein source? These days, many protein bars out there market themselves as 'Low Net Carbs' on their bar due to the fact that they have high fiber content of 15-20 grams and since it's fiber, it can't be digested. The issue however is that the main fiber source in nearly all of the bars these days comes from Isomalto Oligosaccharide Fiber, more commonly referred to as IMO fiber. When they were first introduced, IMO fiber was thought to be the holy grail...acting not only as a fiber but as a sweetener, allowing for bars to not only have a 'low net carb' content, but also minimal sugar. The problem is that upon further research, it was found that IMO fiber is 83% as digestible as maltose under resting conditions and 69% as digestible following an exercise period. This this means that IMO syrup is in fact digested, absorbed and metabolized and contains 2.7 to 3.3 kcal/g. Putting this into simple perspective, a protein bar that has 20 grams of IMO fiber has 54-66 calories more than anticipated! Even with this emerging research, many protein bars out there still contain IMO, claiming and deceivingly listing them as prebiotic fiber. Why would you trust your nutrition to a bar that has skewed nutrition and questionable ingredients? ProSupps MyBar Pro always has been and always will be IMO free and contains only 4g sugar per bar. ProSupps MyBar Pro is the professional choice in nutrition, designed to perfect the art of the soft-baked protein bar. Formulated using 30g of the highest biological value protein available, only 4g of sugar, and containing no gluten or 'fake fiber', the decision is easy. For a bar that works as hard as you do, MyBar Pro goes above and beyond the competition. Peanut Butter Paradise This is a Buy 1 Get 1 FREE offer!